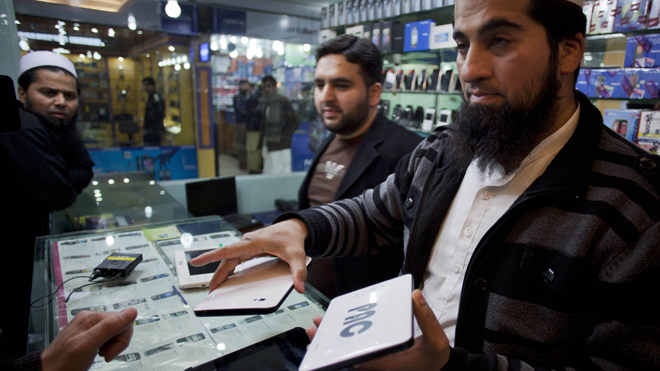 Catch me if you can ... Mohammad Imran holds a locally-made PACPad computer tablet at his electronics store in Rawalpindi, Pakistan. KAMRA, Pakistan – Inside a high-security air force complex that builds jet fighters and weapons systems, Pakistan's military is working on the latest addition to its sprawling commercial empire: a homegrown version of the iPad. It all comes together at an air force base in Kamra in northern Pakistan, where avionics engineers -- when they're not working on defense projects -- assemble the PACPAD 1. 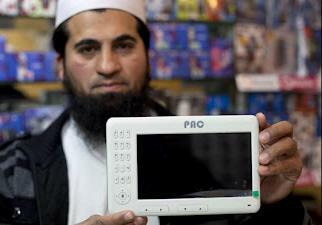 Mohammad Imran holds Pakistani-made PACPad computer tablets at his electronics store in Rawalpindi, Pakistan. Pakistani military engineers who make high-tech air force instruments are being put to work on the device, which is built from Chinese-made components and runs on Google's Android system.